Personalized, hand-crafted solid oak axe plaque, measuring 11"H x 24"L with a 36" axe that has a solid bronze axe head with an oak handle. Plaque and axe handle have a lacquer finish. Highlight colors are Red or Black. Personal information you want to include; such as name, department, company, rank and years of service. Plaque is available in three styles. Name above axe, in raised oak script lettering; up to 25 letters & spaces. Department initials below axe are oak. Information below axe to left and right of initials are vinyl. Axe plaque is a combination of raised oak script lettering above axe; and carved information below axe. Axe plaque has fully carved information above and below axe. Information carved on axe handle. Brackets included. 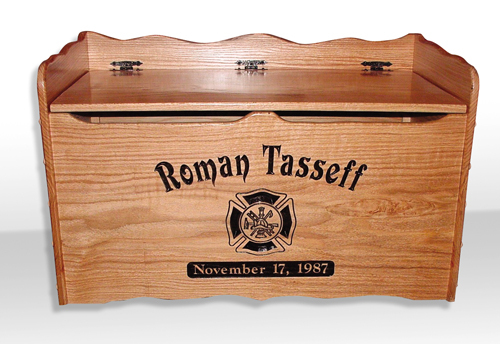 Personalized solid oak products, have a lacquer finish. Highlight colors are Red or Black. You provide personal information, such as name, department, company, unit, rank, years of service. 14" x 14" x 3/4"
You provide photo for center. 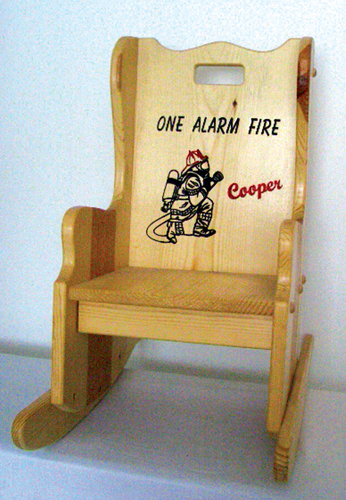 Shown in pine, with Firefighter Design and child's name. Suitable for ages 1 to 7 years. Rocker design helps to deter accidental rock backs. Also available in solid oak. 22"H x 36"L x 20" sides. 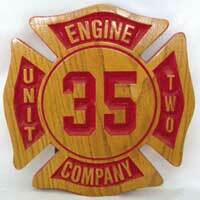 Personalized plaques in solid redwood with a lacquer finish suitable for outdoor use. Highlight colors are Red or Black. 10½" H x 20" L. Shown with Fire Scramble. 9" H x 18" L. Personalize with name. 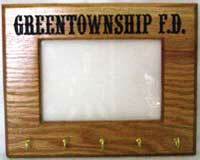 Looking for a gift or award for someone in the Fire Service Community? 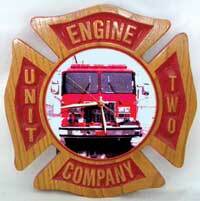 We manufacture unique personalized, handcrafted wood gift awards to show your appreciation to a Firefighter for their dedication and service to your Fire Department and Community. 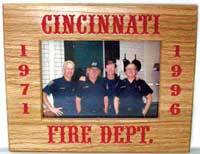 We offer Retirement, Recognition, Memorial Axes and Axe Plaques, Maltese Cross Badge Plaques and Clocks, Signs and Fire Truck Plaques Signs, Rocking Chairs, Picture Frames, Toy Boxes/Storage Chests and Trunks; all with a Firefighter Theme.